Dissidence is threatening to disrupt the Congress applecart in as many as 15 constituencies even as the PPCC today dangled the threat of disciplinary action against them. Also, the Congress high command has put into action two of its central troubleshooters, Oscar Fernandes and BK Hari Prasad, who met a few rebel leaders today. The Bhaujan Samaj Party (BSP) is hoping to cash in on the "pro-Mayawati wave" in Uttar Pradesh to make a dent in the poll prospects of its rivals in Punjab. Having decided to field candidates on all 117 seats in the forthcoming Punjab Vidhan Sabha elections, the BSP claims itself to be the only party in Punjab that did not have to deal with factionalism. SAD chief Sukhbir Singh Badal has managed to convince senior party leaders Gurcharan Singh Channi and Parmjit Singh Raipur to support SAD nominee and hockey star Pargat Singh. Rebels have become a headache for the Congress in Nakodar and Jalandhar Cantt, the two important assembly constituencies of Doaba where the party has fielded Amarjit Samra and Jagbir Brar, respectively. Women as candidates in their own right is still a far cry in Punjab with both the Congress and the SAD allotting seats to women relatives of senior leaders to fill the 'women quota' in the coming elections. PPP president Manpreet Badal has said contesting elections from two seats is part of poll strategy. Manpreet, who today held a road show in Jalandhar, said, “I will be holding at least 80 rallies in the coming days”. An FIR has been registered against SAD candidate from Bholath Bibi Jagir Kaur following a complaint by her Congress candidate Sukhpal Khaira. The FIR relates to the seizure of 183 cases of liquor from a tempo at Talwandi village here last evening. A Ferozepur lawyer, Rajan Aul, in a complaint filed before the Election Commission, has alleged that senior IPS officer SL Gakhar (IG, Patiala Range) had illegally provided several commandos to his son Vikramjit Singh Gakhar, who was reportedly helping rebel Congress candidate from Ferozepur (City) Ravinder Singh Babbal in the campaign. Banking upon the legacy of the Barnala family, former Dhuri MLA Gaganjeet Singh Barnala, son of former Punjab CM Surjit Singh Barnala, has started a new inning in the Punjab politics by throwing his hat in election arena on the People's Party of Punjab ticket. Amritsar: The Congress seems to have switched over to damage control mode to quell rebellion in Amritsar. This became evident when senior Congress leader Oscar Fernandes accompanied by Jagmeet Brar today visited the residence of Simarpreet Kaur Bhatia who was replaced with former Mayor Sunil Datti as Congress candidate from the newly carved out constituency of Amritsar (East). The Election Commission of India has for the first time devised a comprehensive communication plan of using SMSes for getting reports on the poll day and tracking each development at the booth-level across the state in real time. The elections to the Punjab Assembly have come as a boon for the Income Tax department, as the department has recovered a huge amount of unaccounted cash in the run-up to elections. In just 20 days, since the model code of conduct came into force, the State Static Surveillance teams have over Rs 20 crore as unaccounted cash, from different parts of the state. It will be a difficult choice for locals as all the three main contenders in the assembly elections here are "outsiders". Mansa has been a Congress stronghold for the past about a decade, with sitting MLA Sher Singh Gagowal emerging victorious twice: in 2002 and 2007 assembly elections. However, the 72-year-old veteran has decided to hang his boots up this time and managed to secure the party ticket for his daughter-in-law Gurpreet Gagowal. A triangular contest is expected between Congress candidate Rana Gurjit Singh, SAD's Sarabjit Singh Makkar and PPP candidate Raghbir Singh on the Kapurthala seat. This constituency has voted for the Congress in four out of the five assembly elections (including 2004 byelection) held since 1992 while the SAD could win only in 1997 in the last two decades. With Punjab BJP president Ashwani Sharma deciding to contest the assembly election from Pathankot, sitting (BJP) MLA Master Mohan Lal has been left out in the wilderness. However, Lal says he did his best for the area and even if the party had ignored him, he still was a “loyal soldier of the party”. Resham Singh, an NRI based in the US, has approached a Delhi court requesting that his testimony about senior Congress leader Jagdish Tytler's role in 1984 anti-Sikh riots should be recorded before the court gives its final verdict on the closure report filed by the CBI. Stressing on the need to be innovative and possessing a winning streak to be a good leader, Arunanchal Pradesh Governor General JJ Singh (retd) dwelt at length at the basic leadership qualities during the fourth Shaheed Nanak Singh Memorial Lecture on 'Leadership' organised by Punjabi University, Patiala. While the INLD from Haryana will be campaigning for the ruling SAD in the Assembly elections, the SAD's arch-rival in the neighbouring state's Panthic arena, Haryana Sikh Gurdwara Prabandhak Committee (ad hoc), has decided to campaign against it in the elections. Sayad Rasool is behind bars even after the completion of his jail sentence. The foreign national continues to be in Amritsar Jail because neither the Centre nor the State of Punjab really knows whether he is from Pakistan or Afghanistan. With only two days left for the withdrawal of nominations, the Punjab Congress has not been able convince key dissidents to withdraw from the fray. Most of these seats were earlier being considered safe for the Congress candidates. PPCC reconciliation committee head Ramesh Singla has ended all efforts at reining in the Congress rebels. He said he had given up the exercise and was now concentrating on campaigning on behalf of Raninder Singh in Samana constituency. Party sources said though efforts were still being made to rein in the dissidents with PPCC president Capt Amarinder Singh trying to persuade many leaders to fall in line, the party was likely to face opposition from its own men in at least 12 constituencies. Those who have fallen in line include Harjinder Thekedar and Darbari Lal. n Dissidents are set to give trouble to official candidates in Kotkapura where veteran leader Upinder Sharma, who has a large following, will be pitted against party candidate Ripjit Brar. n Former legislator Ravinder 'Bubble" Sandhu is pitted against Parminder Singh Pinky in Ferozepur City. n The same is the case in Fatehgarh Sahab where former MLA Harbans Lal is challenging senior Youth Congress leader Kuljit Singh Nagra. n In Khanna, District Congress Committee president Bhalender Singh is now challenging Gurkirat Singh Kotli. The rebel is a supporter of former PCC president SS Dullo, who was also an aspirant for the seat. n In Qadian, the going has been made difficult for Gurdaspur MP Partap Bajwa's wife Charanjit with Congress leader SS Chottepur also jumping into the fray. n In Nawanshahr, former Minister Dilbgah Singh's son Charanjit Channi is challenging party nominee Guriqbal Kaur. n In Pathankot, rebel Ashok Sharma is contesting against former minister Raman Behl. n In Ludhiana East, Jagmohan Sharma is hurting Gurmail Pehalwan. n Congress candidate from Amloh Randeep Singh, who seemed to be very strong despite shifting constituencies, is now facing a challenge from rebel Gurdev Singh, block samiti chairman. 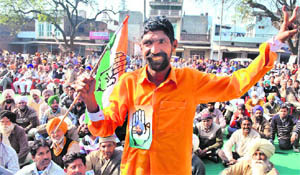 n In Balachaur, Ram Kishan Kataria is posing a challenge from the seat given to Youth Congress nominee Rajwinder Lucky. n In Chamkaur Sahib, party nominee Charanjit Channi is facing a challenge from block leader Gurpreet Singh. n In Dera Bassi, former Preneet loyalist Deepinder Singh Dhillon is giving a tough fight to party candidate Jasjit Randhawa. Meanwhile, PPCC chief Capt Amarinder Singh today appealed to the rebel candidates to withdraw from the race or get ready to face disciplinary action. BSP state president Avtar Singh Karimpuri claims the party had been strengthened at the grassroots level after the 2009 Lok Sabha elections with the cadres and organisational setup having been restructured. The BSP is going ahead with the slogan "Reject both Congress and SAD-BJP who have failed to check corruption, control inflation and provide employment". When Mayawati addressed a mammoth rally in Chandigarh last year, it was felt that this was a move on her part to build pressure for forging an alliance. But with the BSP announcing to go it alone and then fielding candidates on all the seats, the BSP is hoping to have some presence in the next Vidhan Sabha. In 1992, with the SAD boycotting the elections, the BSP polled 16.32 per cent votes and had nine legislators, the largest ever, in the Punjab Vidhan Sabha. The BSP vote share dropped to a mere 7.48 per cent in 1997. It dropped further to 5.69 per cent in 2002. By 2007, the BSP was totally fragmented in Punjab and it polled only 4.10 per cent votes. Karimpuri claims the votes the BSP would poll in the 34 seats reserved post-delimitation would cross 6-7 per cent, enough to bring about a swing in electoral fortunes of many. With the Democratic Bhaujan Samaj Party and the Bhaujan Samaj Party (Ambedkar) nearly losing base, the main BSP is targeting the 29 per cent Scheduled Caste population of Punjab (the highest in the country). In 2007, the BSP contested 115 seats, but won none. But on 17 seats, its candidates secured over 10,000 votes, a substantial number to tilt result. These seats were Adampur, Jalandhar (south and North), Nakodar, Nur Mahal, Banga, Nawan Shehar, Phillaur, Phagwara, Mahalpur, Sham Churasi, Gardhiwala, Ludhiana (Rural), Banura, Dhuri, Guru Har Sahai and Malout. A majority of the BSP candidates this time are new, but the party has fielded important leaders in many seats like Garshankar (Gurlal Shaila), Nawanshehar (Vinod Kumar Slow), Chabbewal (Gurnam Singh), Phillaur (Baldev Kumar), Fazilka (Mohan Singh), Adampur (Sukhwinder Kolhi), Phagwara (Jarnail Nangal), Banga (Thekedar Rajinder) and Kharar (Arjan Gujjar). In Doaba where the BSP has strong presence, it can alter many a calculation of the Congress, the SAD-BJP alliance and even the Sanjha Morcha that are banking on some seats without taking the BSP factor into consideration. “Now that the party president has asked us to support Pargat, we will do that,” said Raipur. On the other hand, the rebels have become a headache for the Congress in Nakodar and Jalandhar Cantt, the two important assembly constituencies of Doaba where the party has fielded Amarjit Samra and Jagbir Brar, respectively. Baba Rajinder Singh Johal, former president of the district unit (rural) of the Congress, is opposing Jagbir Brar after the latter was given the ticket. Johal is now contesting as a PPP nominee. Similarly, former Noormahal MLA Gurbinder Singh Atwal, who was denied the Congress ticket from Nakodar, has been giving sleepless nights to Congress candidate and four-time MLA Amarjit Samra. On the other hand, SAD chief Sukhbir Singh Badal has managed to convince senior party leaders Gurcharan Singh Channi and Parmjit Singh Raipur to support SAD nominee and hockey star Pargat Singh. “Now that the party president has asked us to support Pargat, we will do that,” said Raipur. The main parties-SAD, Congress and BJP-have all fallen far short of the much-talked-of 33 per cent quota for women. The Congress has fielded 11 women, the SAD nine and the BJP two. From the BJP, Dr Navjot Kaur Sidhu, wife of Amritsar MP Navjot Sidhu, is a candidate for Amritsar East while Vijay Luxmi Bhadu is a nominee for Abohar seat. All women Congress nominees, except for Youth Congress' Satkar Kaur from Ferozepur Rural (reserved), are kith and kin of senior leaders. Among them are Gurdaspur MP Partap Singh Bajwa's wife Charanjit Kaur Bajwa from Qadian and Jalandhar MP Mohinder Kaypee's wife Suman from Jalandhar West; Karan Kaur Brar, daughter-in-law of former CM Harcharan Singh Brar from Muktsar, Harbans Kaur Dullo, wife of former PCC president Shamsher Singh Dullo from Bassi Pathana, Gurpreet Kaur Dhaliwal, daughter-in-law of MLA Sher Singh Gagowal ,and Guriqbal Kaur, widow of former legislator Parkash Singh. 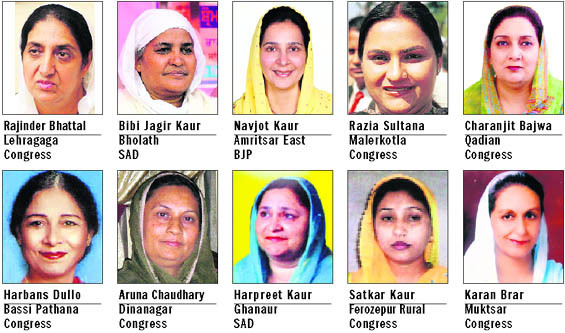 Sangrur district is well represented by the Congress with three women legislators being renominated- Razia Sultana from Malerkotla, wife of senior police officer Mohammad Mustafa, Congress Legislature Party Leader Rajinder Kaur Bhattal from Lehragaga and Harchand Kaur from Mehal Kalan (reserved). The SAD has fielded three women candidates in Patiala district and none from Majha. The six new SAD women candidates are all relatives of senior leaders. Kuldeep Kaur Tohra from Patiala Rural is the daughter of the late Gurcharan Singh Tohra, Harpreet Kaur from Ghanaur is the wife of former minister Ajaib Singh Mukhmailpur from Ghanaur, Varinder Kaur Loomba, daughter of a former MLA from Shutrana, Satinder Kaur, widow of former MLA Jatinder Singh Kariha from Nawanshahr, Rajwinder Kaur, daughter of former MLA Jora Singh from Nihalsinghwala (reserved) and Jagmeet Kaur Sandhu, daughter-in-law of former minister Satwant Kaur Sandhu from Chamkaur Sahib. Among the established women leaders in the SAD Finance minister Upinderjit Kaur (Sultanpur Lodhi), who is the daughter of former minister Atma Singh, sitting legislator Mohinder Kaur Josh (Sham Chaurasi), daughter of former MLA Arjan Singh Josh, and former SGPC president Jagir Kaur, daughter-in-law of former MLA Bawa Harnam Singh, have been allotted the ticket. It's widow versus widow in Nawanshahr, even as the wives of two cops - one serving and the other retired- slog it out in Malerkotla. Replying to a question about his contesting elections from Maur as well as Gidderbaha, Manpreet said, “Considering Maur a safe seat, there were three aspirants for PPP ticket. As there was no unanimity among them, they asked me to contest elections from Maur too”. He added, “Elections are fought on strategy and contesting from Maur is also part of poll strategy. As I had earlier contested from Gidderbaha only, my opponents would have tried to contain me there. But now I will give only one day each to Gidderbaha and Maur and the rest of the time I will campaign in other constituencies”. Manpreet flayed both the Congress and the SAD-BJP alliance for not releasing their manifestoes even as the polls are just days away. “This shows that none of these is bothered about the issues of the common man,” he said, adding, “The PPP had released its common minimum agenda about three weeks ago”. He, however, expressed fear that Rs 10,000 per voter might be spent in Gidderbaha by his opponents. “Whatever they do, they will not be able to defeat me”. Kapurthala SSP SS Mann said the FIR had been registered at Begowal police station under Sections 171, 506 and 188 of the IPC and Section 123 of the Representation of People's Act. Opposing the registration of the FIR, Jagir Kaur, a former SGPC chief, too, lodged her complaint with Bholath election observer Arvind Janu. Terming the FIR as false, she demanded its immediate cancellation. The election observer has forwarded her complaint to the SSP with a note that read: "The petition may be inquired into and due legal action may be taken immediately". Mann said the matter was being investigated by Begowal SHO. While Khaira alleged that the liquor was meant for distribution among the voters at Jagir Kaur's behest, the latter claimed the police had registered a false FIR against her and her kin "under pressure" from the sitting MLA. Jagir Kaur contended that liquor contractor Yadvinder Singh was running 10 vends in the area and was shifting the consignment from his Kuka vend to Talwandi vend after taking oral permission from the ETO. Yadvinder Singh claimed that he had all the valid documents and proof, which were shown to the ETO and other officers present there, but they “still registered the case under political pressure”. Alleging that the black commandos of Punjab Police had in fact been provided to his father, who was posted at Patiala, he claimed Vikramjit was living in Ferozepur and “misusing” the cops to influence voters. The lawyer alleged that Vikramjit along with the cops was once spotted at the cremation ground in Ferozepur city along with Babbal. In the second instance, there was a gathering of Nirankari Mandal at the busiest road of Ferozepur city and Vikramjit Gakhar along with the commandos accompanied the Independent candidate, thus, causing a jam on the road, he claimed. The lawyer has demanded a ban on the entry of the Gakhar family in Ferozepur (City) constituency. During his electioneering in villages of Dhuri today, the PPP candidate asserted that it would be a decisive poll battle in Dhuri this time. He added that both the Congress and the SAD were playing "dirty politics" just to grab power. Striking an emotional chord with villagers of Lada Kothi, Gaganjit referred his father's name several times in his speech. "Badals have sold off the 'Sikh Panth' by indulging in all illegitimate activities. People of Punjab are now ready to dethrone the corrupt SAD-BJP out of power. I am confident of making a comeback by winning this seat as the PPP candidate," he said, while speaking to TNS, on way to Kanjhla village. Taking a dig at the Badals, Gaganjit accused Punjab Deputy CM Sukhbir Singh Badal of indulging in unethical politics. "I am sure that the day ballot boxes are opened, people of Punjab will see a new era of politics, with PPP emerging as one of the most strong political outfits in this agrarian state," he said. The EC has codified SMS format for reporting each event even on the poll day, including reaching of teams at their respective booths and setting up of EVMs. There are also codes for the poll day for procedures like conduct of morning mock drills and hourly poll percentage with details of men and women who would have voted. The presiding officers at each booth would be sending these SMSes through their mobile phones which would be further tracked by dedicated servers and automatically diverted towards respective supervisors, ROs and a cumulative report would be sent to the DEO, observers and further to the Chief Electoral Officer, Punjab. SMSes have also been codified for alerts for EVM problems or any violence-related incidents. There would also be SMS codes for number of people standing in each polling booth even at 5 pm so as to have an idea of as to what time the total votes and poll percentage could be ascertained. In the previous elections, all such reports were obtained either through fax or at landline phones which was not only cumbersome but also often led to delays. But the reporting would now be done in matter of seconds. District Election Officer Priyank Bharti confirmed having received similar instructions. He said the poll staff would be trained for this purpose during rehearsals to be held for election duty. He added that mobile phone details of entire poll staff was already with the EC for a quick delivery of messages. Information available with The Tribune shows that of the total unaccounted cash that has been recovered from across the state so far, Rs 9.64 crore has been seized by the Income Tax department. This is the money for which the bearers could not give any explanation as to the source of the cash. This amount, recovered in the past 20 days, is almost equal to what the department has seized during its seven search and seizure operations carried out during the last nine months on several business premises in the state. It is learnt that the maximum seizures have taken place in Ludhiana, where the income tax department has seized over Rs 1.60 crore. This surely proves that Ludhiana is not just the financial capital of the state, but also the city having the highest unaccounted for income. This is closely followed by the seizure of Rs 1.50 crore in Patiala district. As per Election Commission's guidelines, any person carrying cash over Rs 2.5 lakh would have to support the same with evidences during checking. Officials in the investigation cell of the Income Tax department informed The Tribune that while the surveillance teams formed by the police are checking vehicles for unaccounted cash and referring them to the I-T department. "We are going strictly by the provisions of the Income Tax Act and the cash recovered from each person is being deposited against his name, with his concerned Income Tax Assessing Officer. When the person from whom this cash is seized files his annual income return, this amount seized will be included as his income and he would have to pay tax on this income," said a top official. He added that this confiscation of black money would add to the detection of total unaccounted money by the department during the current fiscal. Acknowledging that unaccounted cash seizure to prevent its misuse in ensuing state elections have caused panic among people, he said that the movement of undisclosed cash across the state had come down considerably. It may be noted that cash seizures by surveillance teams with the aim to ensure free and fair elections have caused a lot of resentment amongst the industry and trading community in the state. On its part, the Election Commission has enhanced the limit of the cash one is allowed to carry without drawing the ire of the surveillance teams from Rs 1 lakh earlier to Rs 2.50 lakh now. SAD candidate Janmeja Singh Sekhon belongs to Ferozepur. He is Irrigation Minister in the incumbent state government. The SAD moved him here because his earlier constituency has become reserve. Congress candidate Mangat Ram Bansal is from the Budhlada area. He was elected last time from Budhlada, but this constituency has also been declared reserve. The third candidate is PPP chief Manpreet Singh Badal, who is from Gidderbaha. Local activists of these parties are a disappointed lot. There were several local aspirants for the Congress ticket for this constituency. But they were denied the ticket. Likewise, there were some strong contenders for the SAD ticket, but the party leadership opted for Sekhon. 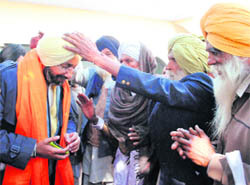 The PPP had first given ticket to Sukhpal Singh Bhullar, an award winner progressive farmer, who is Manpreet's friend. However, later it decided to make Manpreet as candidate. All the three candidates will have to work hard to convince locals that they would not let them down in case of victory. Sekhon is married in a nearby village. He is highlighting that to win support of the locals. The SAD has fielded Prem Mittal, who is being projected by the SAD ticket aspirants as an outsider. Those in the race for the Congress ticket, too, were not too happy on the same being allotted to Gurpreet, alleging the nominee was never seen with her father-in-law and sitting MLA at party meetings and other related functions. She, they alleged, was also not in the know of the grassroots-level politics in Mansa. Projects: While SAD nominee Prem Mittal claims that the ruling coalition had announced grants worth crores for the construction of roads, laying of sewerage system, streetlights and providing other civic amenities to the people, sitting MLA Sher Singh accuses the SAD-BJP government of meting out a stepmotherly treatment to the segment. He claims the ruling regime did not release a single paisa for any development work over the past five years. But, says Gagowal, funds from the Centre did flow in at regular intervals. He says the Bathinda-Mansa railway line under-bridge, a long pending demand of the residents, had been met even though the residents say the structure had proven to be of little help in mitigating the traffic woes. Though the sitting MLA does not have many projects to his credit, he claims he brought in "aplenty" during the Congress regime. He says Mansa got district status due to his efforts. VOX POPULI: The area residents complain that the railway under-bridge remains waterlogged during the rainy season, which poses a problem to the commuters. Lack of streetlights near the bridge, too, was a cause of concern as a rise in the number of robberies had been witnessed near the newly built structure. As a result, the commuters had no option but to avoid the under-bridge during night hours despite lakhs having been spent on its construction. Sewerage lines have also been laid in several parts of Mansa, but they become non-functional during monsoon, thereby, leading to flooded streets and a nightmarish experience for the residents. The issues of potholed roads and clean drinking water, too, remain to be addressed. LOOKING BACK: In 1980, Buta Singh of the CPI was elected victorious from Mansa whereas the voters sent Jaswant Phaphre to the assembly five years later in 1985. In the next elections in 1992, Sher Singh Gagowal represented the constituency in the Vidhan Sabha. Sukhwinder Aulakh defeated Gagowal in 1997 but the latter successfully contested the last two elections in 2002 and 2007. Sitting Congress MLA Rajbans Kaur is the wife of former Jalandhar MP Rana Gurjit Singh who won this seat in 2002. Having lost the parliamentary elections from Khadur Sahib in 2009, Rana is now contesting from the Kapurthala assembly seat on Congress ticket. The SAD has fielded Adampur MLA Sarabjit Singh Makkar. Having contested several elections from this seat on SAD ticket, former minister Raghbir Singh is now trying his luck on PPP ticket. Projects: The seat mostly remained neglected as far as development is concerned. Sitting MLA Rajbans Kaur and Rana Gurjit Singh blame the ruling SAD-BJP government for not spending enough in Kapurthala as the voters here elected Congress candidate. Rana Gurjit Singh says Rs 16-crore sewerage project was started during the previous Congress government, but the Badal government stalled it even as Rs 4 crore had already been spent. Subsequently, the Congress got the work restarted after getting a direction from the Punjab and Haryana High Court. Interestingly, its cost now increased to Rs 22.9 crore and Chief Minister Parkash Singh Badal laid its foundation stone for the fourth time in October last year. Though a modern jail was also built at a cost of Rs 122.14 crore at Theh Kanjla, it is not directly beneficial to residents of the area. Work on the construction of district administrative and courts complex is going on. VOX POPULI: The people are mostly unhappy over negligible development. They say most of the city roads are in dilapidated condition. The Kanjli road from War Memorial to Police Lines, Kala Sanghia road from Sabzi Mandi to Industrial Area and the road from Ramneek Chowk to Dana Mandi and DC chowk to Bus Stand are in bad shape. The locals are also unhappy over the improper system of lifting garbage, which keeps on piling at various places. They also express dissatisfaction lack of educational institutions here. LOOKING BACK: Congress leader Rana Gurjit Singh's family has won the last three elections from this seat by defeating SAD's Raghbir Singh in 2002, 2004 (byelection) and 2007. In 1992, Congress candidate Gulzar Singh had won this seat by getting just 10,710 votes as Akalis had boycotted the elections while in 1997, Raghbir Singh of the SAD defeated Gulzar Singh. Rana Gurjit Singh had won in 2002. 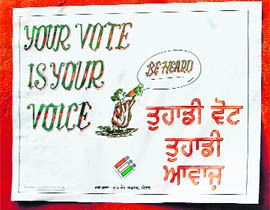 Rana's sister-in-law Sukhjit Kaur in 2004 byelection and Rana's wife Rajbans Kaur had defeated Raghbir Singh in 2007. Projects: The MLA had promised to construct flyovers on the busy Dhangu and Dalhousie roads, besides setting up a government college in the city. Neither the flyovers came up nor the college was established. However, the MLA harps on the fact that he is getting a road constructed from Mirthal to Dinanagar at a cost of Rs 68 crore. This initiative also envisages the construction of a bridge over Chakki river. Veena Rani, a school teacher says, “Once the road is completed, it will mean we can go to Dinanagar directly from Mirthal. As of now, we first have to go to Pathankot from where we have to travel to Dinanagar covering a distance of nearly 42 km…the distance will be shortened by nearly 17 km.” The widening of the Ring Road was also being done at a cost of nearly Rs 7 crore, which has reduced traffic congestion in the town. The MLA claims he worked round the clock to get district status for Pathankot. “I had to fight hard to convince the Sukhbir-Kalia committee that giving district status to Pathankot would prove beneficial to the residents, particularly of Dhar block who earlier had to go to Gurdaspur, 60 kms away, to get their administrative work done,” he added. LOOKING BACK: In 1985, Master Mohan Lal trounced Ram Sarup Baghi of the Congress by 17,500 votes but lost the 1992 elections to Congressman Raman Bhalla by 15,700 votes. Master again won the seat in 1997 by beating Ashok Sharma of the Congress. In 2002, Ashok Sharma of the Congress beat Master Mohan Lal while in 2007, Master beat Ashok Sharma. As per a release issued here by Gurpatwant Singh Pannun, legal advisor to Sikhs for Justice (SFJ), Resham Singh, in his affidavit to Delhi court, described the details of efforts made by him from 2008 till December 2011 to have the CBI record his testimony regarding Tytler's involvement in attack on Gurdwara Pul Bangash. Resham Singh, who used to drive taxi in Delhi, claims that on November 1, 1984 he saw Tytler leading a mob outside the Gurdwara Pul Bangash in which three Sikhs were burnt alive. He said leadership in army, civil life and corporate sector required almost same qualities; it's just that their intensity differed. Narrating incidents from his life, he said a good leader was the one who commanded respect rather than demanding it. "Good leader is a blend of inherited qualities like internal intellect and acquired qualities which are honed over period of years in constantly changing world. It is true that genes play an important role in the formation of a great leader, yet growth in wisdom can play a catalyst role in the formation of a great leader. Therefore one should refrain from stagnation and be supportive of his subordinates in order to be a top-class leader," he added. Arif Choudhary, president of the Pak-India Friendship Society, informed that his NIR friend from New York Abdul Rehman had donated 100 acres of land in Nankana Sahib in Pakistan to establish Punjabi University there. He said they had already started working out the details. "It will be a private university that will provide a common platform to all Punjabis for learning Punjabi language and culture. The reason for choosing this particular place is because this land belonged to Guru Nanak Dev Ji and what could be better than this place to establish Punjabi University," he added. Talking to The Tribune, HSGPC (ad hoc) chief Jagdish Singh Jhinda said they would be campaigning against the SAD in Punjab areas bordering Haryana, right from Patiala to Bathinda district. "Our supporters will fan out in these areas and expose the true face of the SAD. We will sensitise the electorate as to how the SAD led by Badals has been exploiting religion for vested political interests, thereby hurting the Sikh sentiments," he said. He further said that they would try to exploit all their contacts in Punjab and try to cover areas as much areas as possible in their anti-SAD campaign. He, however, clarified that they would not be supporting any particular political party during their campaign against the SAD. "We will throw our weight behind any candidate capable of defeating SAD nominee from a seat, irrespective of the party he or she belongs to," he said, adding that their poll drive would begin next week. The rival faction of the HSGPC (ad hoc) headed by Didar Singh Nalwi has already decided to campaign against SAD candidates in Punjab from January 15. According to Nalwi, the SAD always interferes in Haryana elections, be it Lok Sabha or Assembly polls, and hence this time they have decided to pay it back in the same way. "I have already reached Patiala where I am holding meetings with my supporters. In the first phase, we will campaign against the SAD in Patiala, Rajpura, Phillaur, Ghanaur and Samana," he added. Like Jhinda, he too stated that they would support the candidate having the best winning poll prospects against the SAD. The move, however, is likely to benefit the Congress the most. Earlier, the INLD led by Chautala clan, which shares a good rapport with the ruling Badal family in Punjab, had announced to campaign for the SAD in Punjab. The INLD had also extended its support to the SAD candidates during the SGPC polls held in September last year. The failure of the powers to establish his nationality has now invited the Punjab and Haryana High Court's ire. The Punjab Home Secretary is virtually in the dock over the issue. Rapping both the Centre and the State of Punjab on its knuckles, Justice Ranjit Singh asserted: "I am unable to understand how this simple issue is pending resolution by the State. How can the identity of a person be unknown to the jail or the state authorities once he has faced trial and is convicted…." "In my view, whether the detainee belongs to Pakistan or Afghanistan would hardly make a difference. Once he has undergone the sentence imposed on him, action has to be taken to deport him." "For that, it may have to be seen whether he has to be deported to Pakistan or Afghanistan. But, this aspect was required to be ascertained by all the authorities concerned, once he was about to complete the sentence imposed on him…." "Requisite efforts have neither been made by the Union of India, nor the State of Punjab, to see to an end the agony of this person, which is revealing a serious violation of human rights," the court said. "A simple approach by either the Union of India, or the State of Punjab to contact the embassies of Afghanistan and Pakistan would have led to some solution. It appears that both the governments are palming of their respective responsibilities to each other and have not taken appropriate action in the matter". Before parting with the order, Justice Ranjit Singh asserted: "Let the Home Secretary of the State of Punjab and a representative of the Government of India remain present before this Court on the next date of hearing". The petition seeking Rasool's release has been filed by the World Human Rights Council through its chairman Ranjan Lakhanpal. Rasool was arrested at Gherinda under Amritsar police district and a FIR under the provisions of the Foreigners' Act and the Indian Passport Act was registered against him on April 26, 2009.